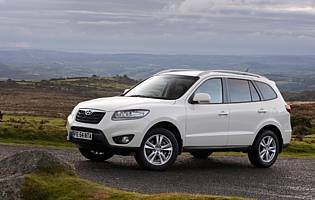 The medium-size SUV has been the exclusive preserve of European car makers for as long as many can remember. Although increasing numbers of buyers are no longer exploiting the full capabilities of such vehicles, the trend for moving further up the premium scale is on the up. That's great if you have deep pockets but what if you want a rounded, affordable SUV? Hyundai hopes you'll choose its revised-for-2010 Santa Fe. If it's a conventional SUV with few frills that you're after, Hyundai's Santa Fe has always been a prime candidate. In years past the SUV has, despite proving to be an effective off-road tool, a little rough around the edges. This latest variant showed that Hyundai was keen to broaden the car's appeal in the burgeoning lifestyle sector. A welcome increase in overall refinement immediately raised the Santa Fe's status to a level alongside many European offerings. The same could be said of the car's looks, which delivered a more sophisticated and mature appearance. Last but not least, the Santa Fe's newfound outright performance ensured that even the critics had to take it seriously. This version, boasting a number of cosmetic and mechanical enhancements, is a welcome step up the ladder in terms of perceived and actual improvements. 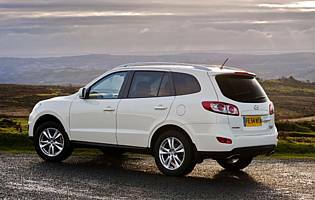 Key to this Santa Fe's performance is its 2.2-litre diesel engine. Coupled with a new six-speed manual or automatic gearbox, the 4x4 can be driven smoothly or coaxed into accelerating rapidly with little effort. It's also relatively frugal and pleasingly flexible and refined. 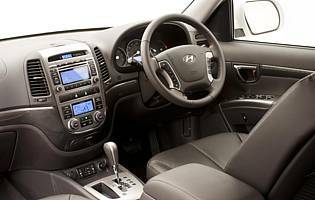 Proof that Hyundai has matured as a car maker comes in the shape of the Santa Fe's driving manners and family friendly practicality. Regarding the former, the SUV delivers a car-like experience with little of the annoying pitch and roll associated with the 'soft-roader' genre. 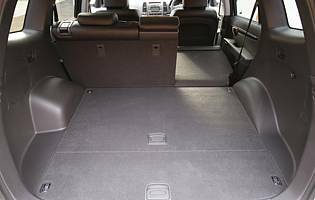 And in seven seat mode, the car can accommodate a large passenger contingent or a bulky load - the choice is yours as the rearmost seats conveniently fold flat into the boot floor. With the traditional mid-size SUV market heavily populated by premium models, it would be fair to think that you need deep pockets for a family-friendly, competent, well-equipped 4x4. Hyundai's Santa Fe is proof that you don't. Sure, other low-cost options exist, but none deliver a rounded experience like the Hyundai. Modest ownership costs, good looks, a stunning diesel engine and a versatile cabin all add up to something special.